Ht / Wt: 5'9" / 183 lb. T.Y. 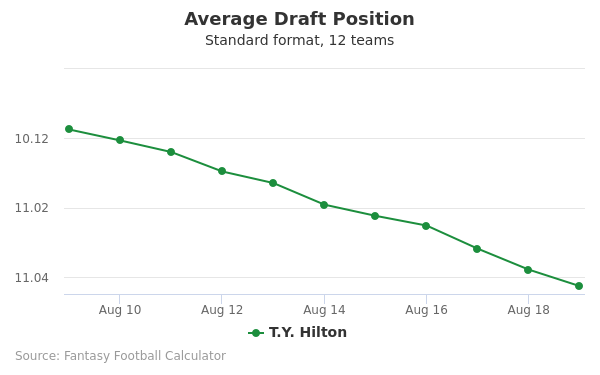 Hilton's fantasy value is measured by his average draft position (ADP) in fantasy football mock drafts. 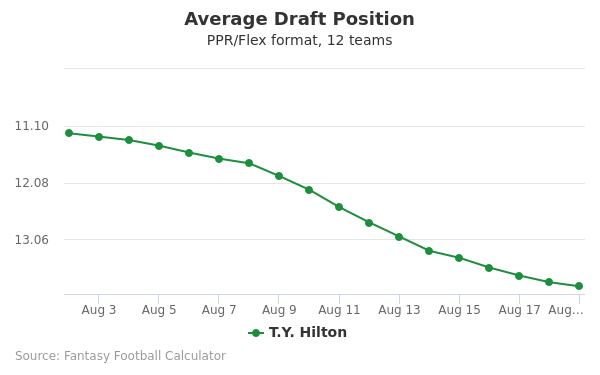 In recent drafts, Hilton's current ADP is 3.01, which indicates that his fantasy outlook is to be the 1st pick of the 3rd round, and 25th selection overall. The code below will display a graph that updates every day to show the ADP data for T.Y. 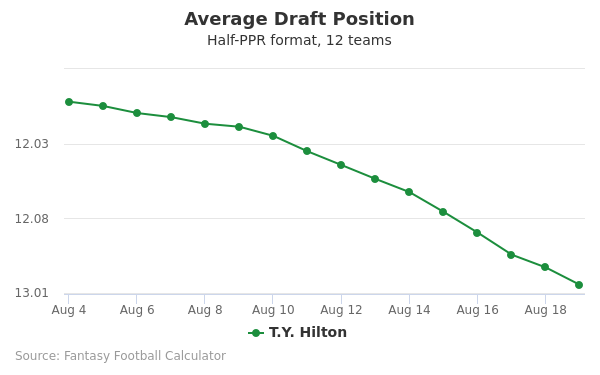 Hilton for the past 30 days in 12-team PPR leagues. Draft Leonard Fournette or T.Y. Hilton? Draft Adam Thielen or T.Y. Hilton? Draft Sony Michel or T.Y. Hilton? Draft A.J. Green or T.Y. Hilton? Draft Keenan Allen or T.Y. Hilton? Draft George Kittle or T.Y. Hilton? Draft Mark Ingram or T.Y. Hilton? Draft Aaron Jones or T.Y. Hilton? Draft Amari Cooper or T.Y. Hilton? Draft Phillip Lindsay or T.Y. Hilton? Draft Derrick Henry or T.Y. Hilton? Draft Stefon Diggs or T.Y. Hilton? Draft Aaron Rodgers or T.Y. Hilton? Draft Devonta Freeman or T.Y. Hilton? Draft Chris Carson or T.Y. Hilton? Draft Brandin Cooks or T.Y. Hilton? Draft Derrius Guice or T.Y. Hilton? Draft Andrew Luck or T.Y. Hilton? Draft Kenny Golladay or T.Y. Hilton? Draft Kerryon Johnson or T.Y. Hilton? Draft Cooper Kupp or T.Y. Hilton? Draft Eric Ebron or T.Y. Hilton? Draft Robert Woods or T.Y. Hilton? Draft Julian Edelman or T.Y. Hilton? Draft T.Y. Hilton or Tarik Cohen? Start Leonard Fournette or T.Y. Hilton? Start Adam Thielen or T.Y. Hilton? Start Sony Michel or T.Y. Hilton? Start A.J. Green or T.Y. Hilton? Start Keenan Allen or T.Y. Hilton? Start George Kittle or T.Y. Hilton? Start Mark Ingram or T.Y. Hilton? Start Aaron Jones or T.Y. Hilton? Start Amari Cooper or T.Y. Hilton? Start Phillip Lindsay or T.Y. Hilton? Start Derrick Henry or T.Y. Hilton? Start Stefon Diggs or T.Y. Hilton? Start Aaron Rodgers or T.Y. Hilton? Start Devonta Freeman or T.Y. Hilton? Start Chris Carson or T.Y. Hilton? Start Brandin Cooks or T.Y. Hilton? Start Derrius Guice or T.Y. Hilton? Start Andrew Luck or T.Y. Hilton? Start Kenny Golladay or T.Y. Hilton? Start Kerryon Johnson or T.Y. Hilton? Start Cooper Kupp or T.Y. Hilton? Start Eric Ebron or T.Y. Hilton? Start Robert Woods or T.Y. Hilton? Start Julian Edelman or T.Y. Hilton? Start T.Y. Hilton or Tarik Cohen? Born on November 14, 1989, Eugene Marquis “T.Y.” Hilton was born in Miami, Florida. He attended Miami Springs High School where he was playing both basketball and football for the Golden Hawks. In his senior year, Hilton was selected as a First Team All-Dade player in football by the Miami Herald. He also was selected in his junior and senior years as being a First Team All Dade in basketball. Hilton had a plethora of college choices in which scouted him to play football for them. He was scouted by West Virginia University, the University of Mississippi, Florida International University (FIU), and the University of Florida. And he chose FIU over West Virginia with the assistance of his son. In 2008, Hilton had a signature move called the “The Hilton Heave” where he threw a 38-yard touchdown pass to a fellow playmate late in the game after fumbling the hand in reverse play. He also accomplished 12 touchdowns during his freshman year, and he was responsible for setting the FIU single season record yards received at 41 receptions for 1,013 yards. The rest of the stats for that year in which he earned the Sun Belt title include him ranking third in the US in the all-purpose yardage for each game with 180.25 yards per contest. During the end of his junior year, he was awarded the Sun Belt of the Year, and he was awarded the title of the All Sun Belt Conference First Team for the return specialist and wide receiver positions. His stats for the junior year included 2,089 all-purpose yards where 282 rushing yards were over 30 carries and 848 of the yards were over 59 catches. Even though starting off slowly, Hilton strongly came back by scoring four touchdowns when playing against Louisiana Monroe. Then, later on during the season, Hilton made 158 yards rushing into six carries. Here are some highlights some of his most proud moments in college football. Hilton’s hard work and spectacular talent and skill finally paid off in 2012. He was drafted as a wide receiver for the Indianapolis Colts of the NFL. Additionally, he was drafted by them during the third round of that year. 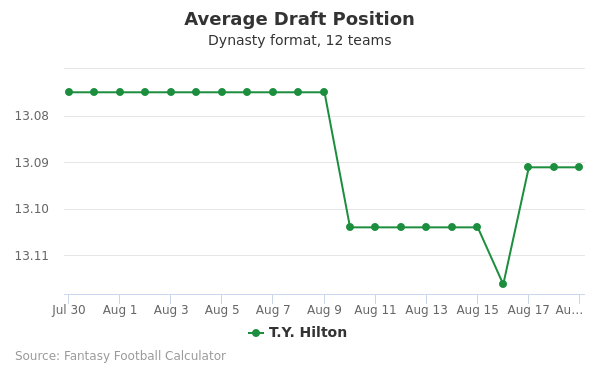 Upon being drafted, Hilton’s career and salary skyrocketed. In just the first three seasons, he totaled 19 touchdowns and 214 receptions for 3,289 yards. He also made 36 catches for 604 yards and two scores for the Colt’s six playoff games during that time. Additionally, he made a deal of approximately $2.64 million during the last season of his rookie contract. Shortly afterwards, he and his family became tremendously blessed with a deal for an extension for six additional seasons with the Indianapolis Colts for $65 million. This includes the year, 2015, according to NFL.com. By the end of 2016, Hilton achievements consisted of him being the NFL receiving yard leader. He also accomplished the 3x Pro Bowl (2014-2016). Some of Hilton’s proud highlights are shown at Youtube. Hilton and his wife, Shantrell, has a son and daughter. His Twitter’s username is @TYHilton13, and his Instagram user name is t.y_hilton13. Also, this site has his jersey and autograph on for sale.